I kept forgetting to use this Morning Wakening Massage gel until now. I got this as part of the Lunasol Anniversary Base Makeup Set. This is a hefty sample, with 10g of product. It sells for 45,000won(about $35USD) for 40g at the Lotte Department Store and $49.00USD on Ichibankao. It's got a very pleasant florally fruity scent so it kinda wakes you up. It comes in a lovely frosted glass jar, so pretty for a sample! The first time I used the gel, I didn't like it because it felt sticky afterwards. I used maybe about a quarter size and just did a quick 2 minute massage on my face. After massaging there's no need to rinse and the gel should absorb into your skin, but it didn't feel like it absorbed very well. The next few times I used the gel, I used a smaller amount, about a nickel size, and only massaged my cheek and forehead areas. After massaging, I used a tissue to blot any access gel and this prevented my skin from feeling sticky. I use this after cleansing my face but before toner and lotion. My skin didn't feel dry or tight afterwards, just soft and smooth. The gel is great at letting my fingers slide around easily on my face. I just massage my cheeks and marionette lines and use my fingers to massage little circles on my forehead. It feels very nice but I don't feel that this is a necessity. I wish I had more time in the morning to use this massage gel, but because I already wake up early and don't want to do anything, this isn't a "must have" item for me. 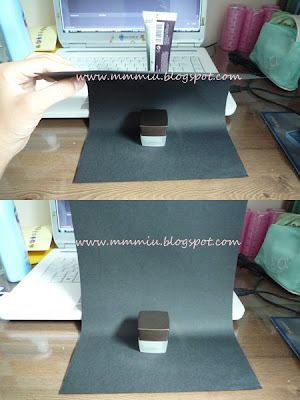 This is my mini photoshoot studio for my products hehehe. I just use a piece of black or white paper and prop it up with something, in this case, a tube of lotion. When I put the item down to take a picture, it's usually heavy enough to hold the base of the paper so I get a nice smooth background. Depending on the lighting, you won't get a shadow behind the product and it looks a lot nicer than taking it on a regular wall background. 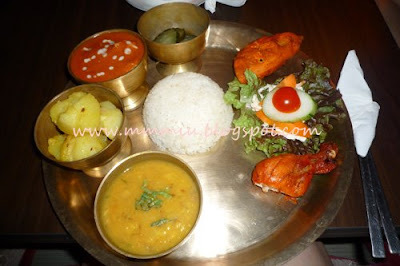 I felt like Indian food yesterday, so I went back to Yeti in Hongdae with a few friends. I can't tell you the directions because it's kinda confusing. Let's just say, if you walk around enough around Hongdae near some of the clubs, you should see a Smoothie King. The restaurant is right next to it in the basement. This is the "Yeti Special" for 13,000won. It also includes naan and chai tea, but I didn't get a picture. When i got this dish, I was like, "this is so small!!!" But surprisingly, this was really filling, I didn't even finish everything. The tandoori chicken was so tender and flavourful, the potatoes perfectly cooked and drizzled with oil that had a hint of cumin. The butter chicken was very aromatic and the chicken pieces were so tender. The yellowish curry I wasn't too sure what it was. It had rice and it was just good haha. I apologize for the lack of..umm..postings and such. Haven't been in blogging mode for a while. I need to purchase more stuff!!! So you probably won't see me pumping out more than 2-3 posts a week. Did I tell you I've booked my plane ticket home? But I don't know when I'll get my e-ticket since I'm waiting for the school to pay. I'm leaving right at the end of August. Too little time now! urgh.. that massage gel costs high.. hihi.. but for a 10g sample it is definitely nice to test the product.. your photo studio is cute!! Thanks for the review! Tasty Indian food--yum! Great news about your ticket home! I can't wait to have some Indian again! Haven't had it since college! Haha I like your "studio" setup! It gives the product photos quite an artistic flair. Thumbs up! Wow. That's so expensive! I don't have that much to spend - but thanks for sharing your thoughts on it ;) The photoshooting area is sooo cute, haha. I got the wakening gel a few weeks ago. I don't use i t much since I think it makes me breakout-boo. mmh the food looks yummy-I always think that my plate is too small but then i never finish it all. i like ur mini photoshoot idea! ive actually been using my blanket.. hehe. and omg i LOVE indian food!! ur making me hungryy. yay i bet ur excited to come back home! I like the food pic! NOM NOM! that looks cute and yummmy! sounds like an interesting product.... but expensive! Dx i wish i'm not so lazy in the mornings. sounds nice to use. Mmmmmm food! Looks and sounds yummy! 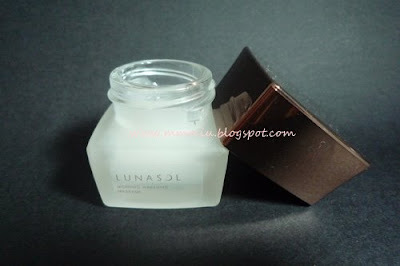 That Lunasol jar is very nice looking! Ohhh you booked your ticket home already! Are you going to haul like mad before you head home?! I have a sample of the Morning Wakening Massage gel as well, and you're totally right it's not a must have item. I still get that sticky feeling after blotting, which I presume has something to do with the humidity in HK. Mmm I do the same thing using Beautymaker's Wakening Gel, first step in teh morning. It's soooo great, not sticky even if I used too much!! :D Hehe. But the LUnasol one does smell very nice. Oo I should use a mini studio for my product photos... if I'm not so lazy.. hahaha.